I have a confession. Since my sons have such strict screen time limits (for my own sanity and theirs) I sometimes worry that they are missing out on educational opportunities that would help them learn real life skills like coding necessary for computer science. Sometimes it is a hard line to navigate but the key is that we focus on STEAM activities. STEAM education emphasizes the integration of technology with science, math, engineering, as well as art + design, so kids never rely on the screen as the primary tool for learning. Be sure to read all the way to the end for your chance to win a SPRK+ Robot of your own! So I was delighted to give my boys the opportunity to experiment at home with the SPRK+ Robot and Sphero Edu app. The Sphero Edu program allows kids to experiment with coding, robotics and technology with hands-on activities. In other words, kids don’t just stare at a screen to learn code. They go beyond code while they build, engineer, and even create art! The Sphero Edu program is an exciting way to learn because it emphasizes every letter in STEAM. Science, Technology, Engineering, Art+Design, and Math. The Sphero Edu program uses the SPRK+ Robot, which is an app-enabled robotic sphere, equipped with Bluetooth SMART. It is even waterproof and shatterproof so kids can really go to town with their experiments. The Sphero Edu app and SPRK+Robot are classroom ready and designed to be used by students of all ages. It is perfect for collaborative educational projects but we tried it out in our living room. My 8 year old and I decided to start out with DRAW, since we were total newbies. You can see in the photo above, the you simply use your finger to draw a path. But it’s actually not as easy as it sounds. It requires trial and error to get the measurements right, and this is where the grid on the app and the measurements on the maze tape really came in handy. By using his math skills, he was about to work out the difficulties. As a parent, it was great to see his mind working hard as he strived to get the code just right. He also loved changing the colors of SPRK+! I love that a tech project got him thinking about patterns of colors. 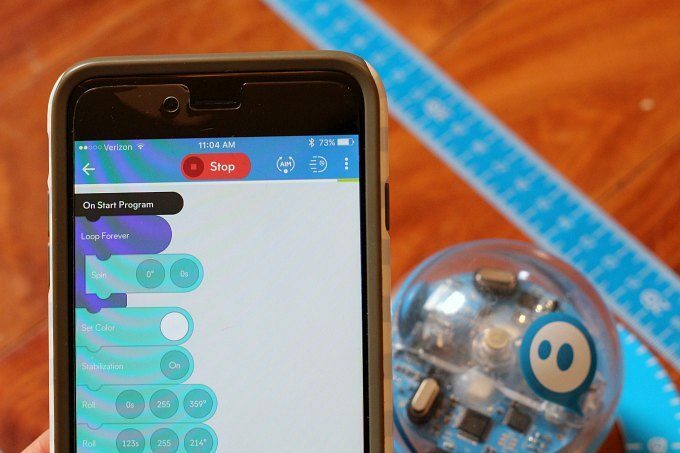 Later on when my 12 year old experimented with SPRK+, he was easily able to start coding with the BLOCKS program on the Sphero Edu app. Both my boys have already started eagerly discussing the experiments they want to try with the SPRK+ Robot, especially my younger son who watched the video with me (see the video for yourself, below!) and really wants to make a SPRK+ powered boat. Personally, I’d love to try creating art with the SPRK+ Robot by sloshing it in paint and coding a design! (I did say it was for all ages!) After trying it out, and listening to his ideas, it is clear how well suited the technology is for classroom settings. 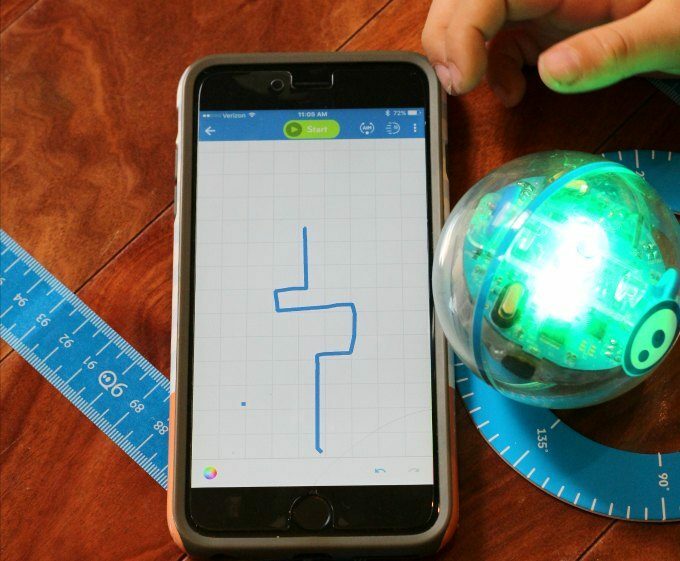 The Sphero Edu program goes beyond code. It incorporates robotics and technology with collaborative STEAM activities in a way that students of all ages and levels can immediately jump into. It is truly real life experience. In addition, the Sphero Edu app includes features that allow kids to share their experiments with others. Educators can get the app and multiple SPRK+ Robots for their classroom. Sphero makes it easy with a specially designed teachers’ guide. Read the Sphero blog on Medium. Watch the video for a quick peek to learn how you can use SPRK+ Robot. Sphero Edu wants you to experience STEAM collaborative learning and is giving away one SPRK+ Robot. In order to enter please visit the Sphero Edu Website and then come back over here to comment with how your kids would use the SPRK+ Robot in a STEAM project. (Be sure to enter via the Rafflecopter widget below after you comment.) Giveaway has ended. This is a sponsored conversation written by me on behalf of Sphero. The opinions and text are all mine. I teach at a school that has 1:1 iPads and this would show them so many other uses for that technology besides gaming! Looks like a lot of fun – my little tech fans would enjoy it! My son would absolutely LOVE a SPRK+ Robot! His birthday is coming up, and he would be super excited to get this as a gift! My son would be crazy about this! What an amazing concept. It is such an amazing STEM tool. Thank you so much for sharing it with us. I am adding this to my wish list. Oh Boy! THAT would be so much fun in my K-8 Library!!! I am interested in starting a STEAM/Maker lab in the library and Sphero could be my Hero to get started. He would have a pretty serious fan club at home as well!! My big kids could use this to create there own town at home! Very cool robot! My girls would love to give this a try! We are a homeschooling family, and my son is into anything robotic. He would really enjoy these for STEAM time! My son loves robots! He would use this to map out a maze for a project. My husband is a software engineer…the image of my girls talking to him about programming and Java makes me giggle with pride. I know that both of my girls would love to incorporate a robot into their days…and I can’t even imagine the adventures they would come up with. I know they would especially get a kick out of designing the route and testing the limits! I see pirate maps and treasure hunting in our future! Sphero would get a lot of use in this house! My son is a bit obsessed with robot anything! Coding would be a big project for us this year. I would use it with my small coop class of preK and K leaners …. AND my kiddos!!! A great way to use the blocks. Love the maze ideas! I work in a children’s library, so I would love to include this in my STEAM Club! We have a monthly Tinker Lab theme where we would use these in variety of ways. 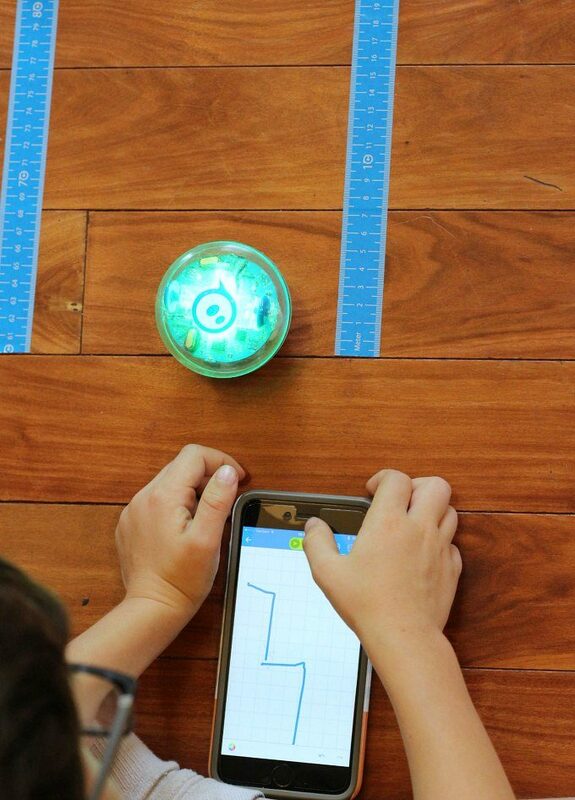 We could make paths on the ground as you’ve shown, use butcher paper on the table to draw out paths, and combine it with our Ozobots for fun robot games! I LOVE the activity of “programming a painting” to integrate some hands-on, creative play into STEAM learning. My camp kids would be so excited to see their programming projects come to life in such a physical, off the screen way! This would be perfect for school this fall as I am attempting my first year of homeschooling! My son really wants to learn about coding and robotics and this would be ideal! I would use this for making mazes which my son loves to do already but I love the idea incorporating the coding. My husband is a software engineer so we know how important coding is in our household. My 6th grade daughter is always creating contraptions and DIY projects. 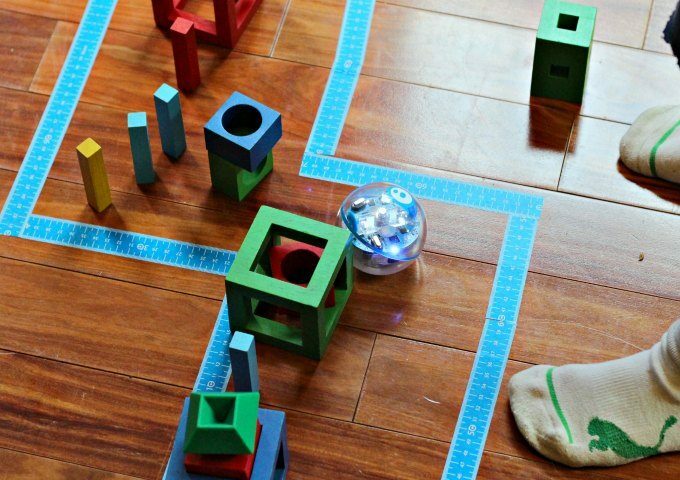 She would love to use the SPRK+ to create elaborate mazes to follow and objects to scale. I appreciate how the SPRK+ nurtures collaboration and creative problem-solving, in addition to learning how to code. Coding is constantly evolving and changing (and will likely be automated in the future), so the big-picture design training is as important, if not more so. Great to see a product like this! My son is taking coding this fall at school, what a great opportunity to try it before class starts. My girls would love painting with it! This is such a neat product! This looks awesome! My son would love this since this is more hands on than on a computer. I see him setting up obstacle courses. My daughter would love this for art. I’d love to try the draw feature with my 8yo! My kids are already into coding, so we would LOVEto experiment with this fun, hands on tool! I think my son would love to create a world and program the robot to explore it. This is so neat! Thank you! This looks like an incredibly fun way to learn about coding. Both of my children want to create mazes and program paintings. Very cool. I’m a librarian at a public library. This would be really fun to have in our lab space! This looks really cool and I know that my boys would enjoy it! We would probably start by coding the SPRK+Robot to draw some designs. I used to do a Robotics class for Middle School kids and have been looking for something for elementary school students – this should be great. The earlier you can get kids interested in STEAM, the better. My 8 year old and 6 year old would have a blast with this! This is interesting, and looks like something to add to my school’s namespace, as well as try out with my son at home! I would love to introduce SPRK+ Robot to my kids. This would be a great way to get them excited about coding and robotics. Oh my goodness! My daughter would probably keep this by her side 24/7 if I let her! Haha She’d probably try to program it to do tricks like a pet would since we’re apartment dwellers. She’s also a big reader, so if she could use it to build a mobile bookshelf, I’m sure that she would! ? We have some dominos and wooden blocks that are not used so much anymore. This would give them a new life, incoporating hands on toys with a robot. Thanks so much for this giveaway! I assist with mentoring an all girls FTC robotics team. The team members plan and run an all-girls K-8 STEAM camp each summer. This would be a fantastic addition to the STEAM program. The chance to provide a hands-on coding experience like this is amazing! I can see how education and technology can change throughout the years. This looks like a cool way to learn something about coding. Cool! My kids are young, but they love robots. This would be a great resource to help them understand more about robots and to start learning about coding. We’ve tried coding at our school for our kindergarteners, which I was skeptical about at first, but they really loved it. However, I thought the programme that was used was too hard for them. This app sounds really good and I’d love to try this with my son to help him with his maths and coding skills. Thank you! My kids would love it if we won! My oldest has been asking to learn to code so this would be perfect for our family. My kids would LOVE this! They’d probably create mazes and other challenges. I’ve seen this in the Apple Store and thought it was fantastic. Would love to try this out with my boys, I know they’d love it. My kiddos could design a road system in their neighborhood maps they create using measurement. Then other groups have to maneuver through their community. Would be great for team building and communication. Seems like there are so many creative and challenging opportunities! My grandchildren have been drawing treasure maps. I know they would love to create one using code and a robot. I’m not even sure yet what all we could use this for in our house. We love building and creating things and this is amazing! I’d love to use Sphere in a large scale interactive art project for kids! My boys would love this, they’re into everything robot right now! I would love to try the Sphero for spelling in the classroom! I am very intrigued with the program. A teacher at my son’s enrichment camp told me how she uses it in the classroom so I’ve been trying to learn more about it to see how it can be used in my second grade classroom! My son, who is very intestesrex in coding, would flip over this too! This looks like a great learning tool. It would be a fun adventure in my gifted elementary classroom! I teach kindergarten. Many of my students are set in front of the tv or playing on mom or dad’s phone. It would be great to show my students that the ipad can be used for more than games. Some of my students do not have access to computer or tablets at home. It would be wonderful if my kinders could learn to code and make a maze to get through. This looks like so much fun! I love the maze with the Twig blocks. My daughter would have a lot of fun with this. It would also be a great starting point for the STEM night I hope to start at school this next year. Adding to say I bet my daughter would love to try to draw with paint. I had no idea it was so versatile! We are a homeschooling family of two and I’m embarrassed to admit, a bit behind in the STEAM scene. Would LOVE to be further introduced to this world by Sphero!! This is so cool! My four kids would enjoy creating mazes for SPRK. Mom and Dad would sneak a turn or two! My oldest son has a great mechanical mind and it would be a blast to see what he could come up with for SPRK challenges. My sons are only 7 and 4, and also have very limited screen time. I’m looking for more ways to incorporate STEAM into our homeschool days. Would love to get my girl into coding ! She’s been really into tech but don’t know how too get her more involvement at home. Love the idea that girls can code too! She builds out of straws and sticks but this is a whole new level! My children would love to create mazes together! I teach K-5 students. We would have to work as a group to use to get started with coding. I regularly participate in Hour of Code. We would want to fund raise to purchase even more so we could work as a class. I would love to use this with my pre k class with our I wonder planner! My kids love to explore and investigate how things works with different media!! I have a group of young GT kids who always need “more.” I’d have them use this to learn about the engineering design process! This looks like an amazing tool to help introduce students to coding. Scaffolding is built into the tool. It would be useful for teaching coding as well as trial and error skills and help them accept the importance of learning from ones mistakes. I want to introduce coding to my students and this looks like it would not only support their leaning, but also be a motivational tool as well! How fun! Thank you for highlighting this and bringing it to our attention. My kids will love it! I have 3 kids – girl(14),boy(12), and girl(6). All three of them would love to have this! We would use this over and over again at many different levels. I teach in a children’s hospital so many different grade levels would have a chance to try this out and learn to code. I picture kids making an obstacle course (of course!) but, better yet, joining us in brainstorming and creating projects for other kids to try. Endless possibilities! This would be a great way to learn coding in a practical way. I’m excited to try this with my girls! Thank you for the giveaway. Sphero SPRK+ looks like so much fun! My kids, (and let’s be honest, the adults in our family too) would love to create our own mazes and paintings by learning coding as well. Anything with a robot is cool and a huge deal, plus its educational so it’s a WIN-WIN! We’d love to try coding. The imaginative possibilities are exciting! Thanks for the chance. This is so cool!! My 11-yr old son would LOVE something like this. I keep trying to get him into coding, but haven’t found a class yet that he thrilled about. 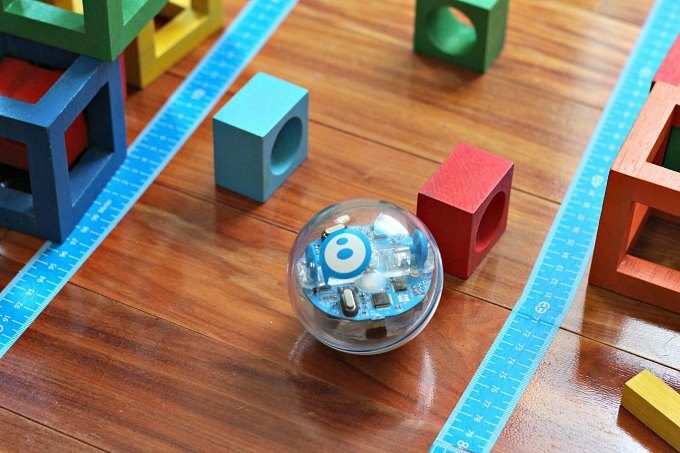 He is very playful, so Sphero would be the thing to get him into coding, I’m sure of it! My son loves anything science related and loves playing with electronics. A sphere robot would challenge him. Love this! My boys would love learning to code and programming it to push things around or do a maze. What a great idea! I think my kids would actually enjoy using this competitively, seeing who could accomplish a difficult goal first or in the most creative way, and, because it has different levels of progression, the age difference might not be a hindrance to their mutual enjoyment (whether they’re working a challenge together or competing, both big motivators in our family).